Last May, documents discovered in the hideout of Osama bin Laden revealed that the Al Qaeda leader dreamed of killing President Obama, as well as “military chiefs like the chairman of the Joint Chiefs of Staff, the defense secretary, top military people,” a counterterror official told Pro Publica. 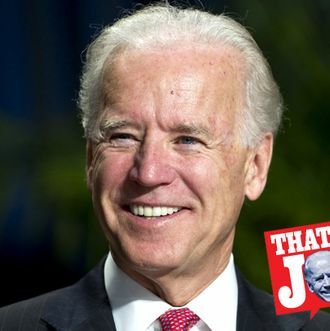 As for Joe Biden … eh. While it was somewhat embarrassing for Biden that he was not considered assassination-worthy, Bin Laden’s analysis seemed like a fairly accurate assessment of the largely ceremonial role that vice-presidents play in American governance, not a personal judgment on Biden.